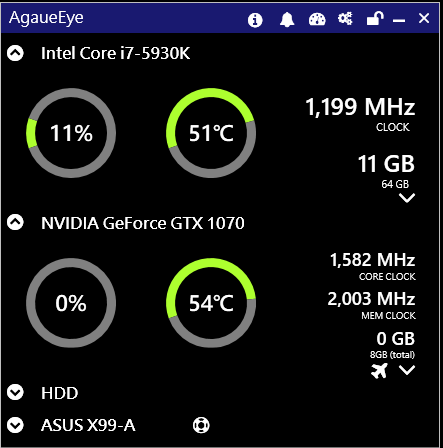 AgaueEye provides full funcional hardware montior, include CPU/GPU/MB/DRAM and more, in desktop, you can quick inspect CPU/GPU state. 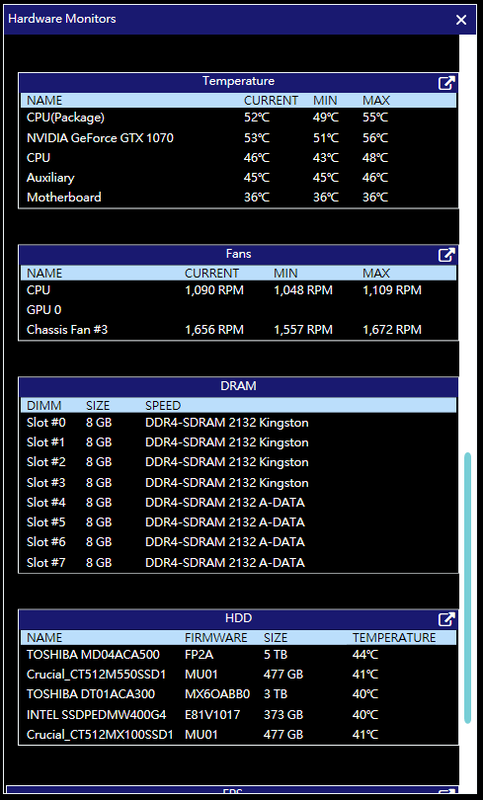 if need, you can expand the motherboard and hdd section to see more informations. 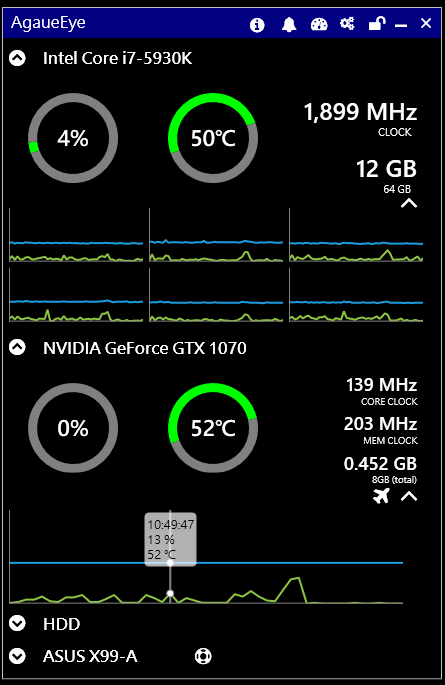 click of CPU/GPU section, can expand the chart. need more? click icon of right top, then you got all hardware infomrations. more more details? 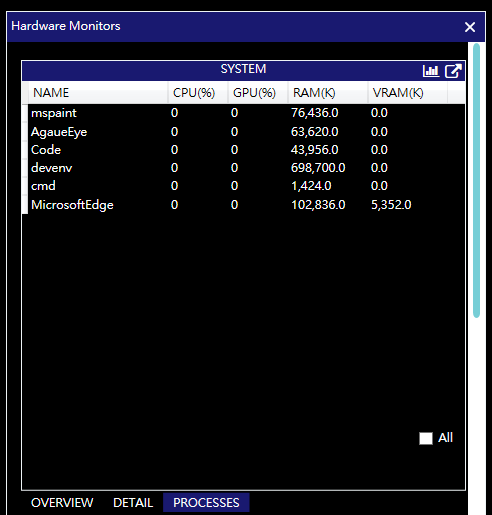 like processes memory usage, CPU/GPU usage? just switch to PROCESSES tab. 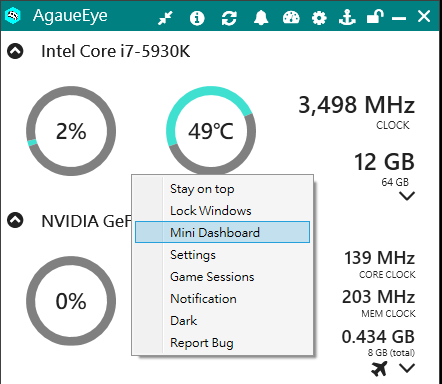 when you playing game, AgaueEye in-game overlay will display hardware information, and all hardware state will be record, you can analysis later. you can choose what's you want to display, just click icon on right top to open advanced setting window. 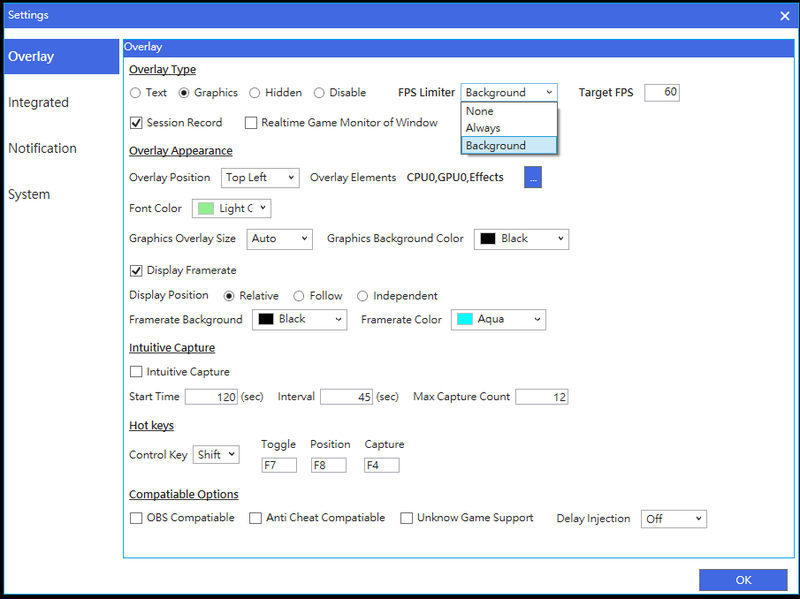 you also can limiter fps if need, there has 2 mode, the Always mean limit all game FPS, the Background mean only limit FPS if game lost focus. 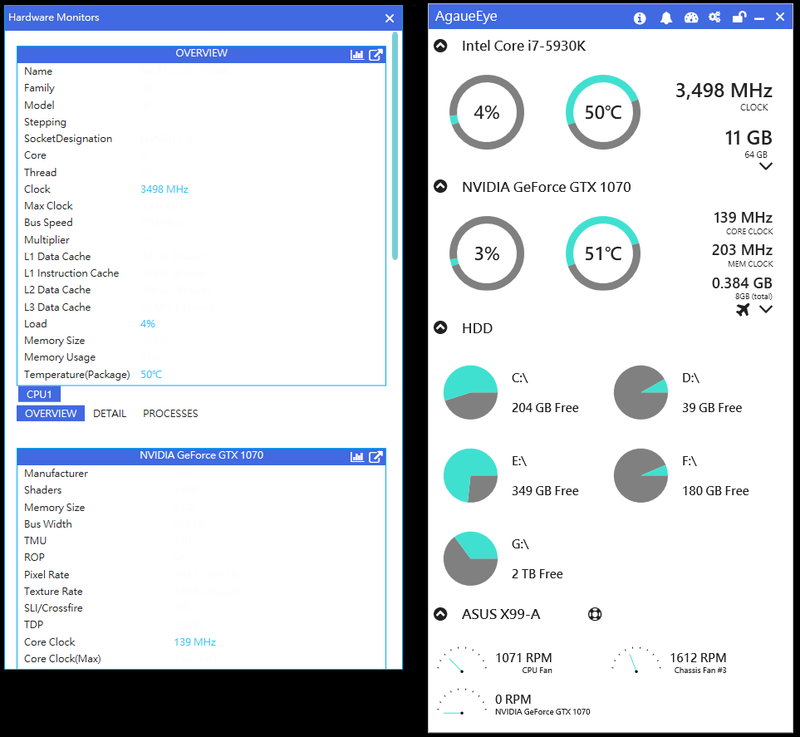 we provides 2 style UI, Default and Dark, you can switch it of advanced setting window, just click and swtich to System tab. you also can change primary/accent colors to change colors. 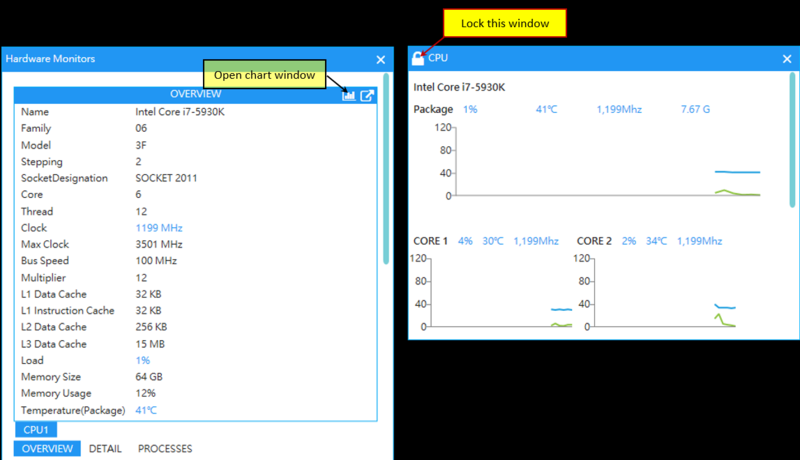 the Advanced Hardware Monitor include many informations, but most time you just concerned 1 or 2 part, in this situation you can click right corner icon to open popup window of part, the popup window also can be lock by click left corner icon, once the pop window is locked, it will show in next time application start with out other actions. you will see the chart icon of some part, it's mean the part support chart mode, see below screenshot. 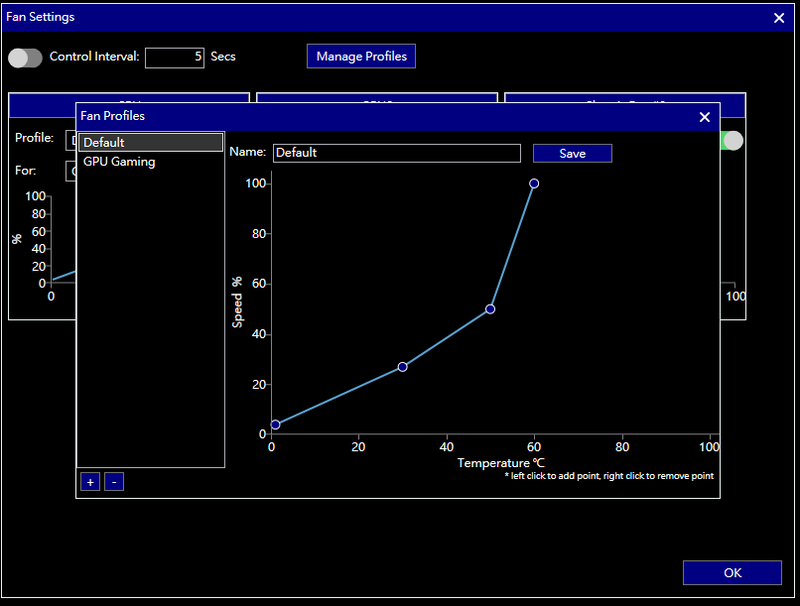 PS: when you use FPS chart window, remember to Enable Realtime Game Monitor Window of Advanced Setting, or you will see the lag response of FPS chart window. 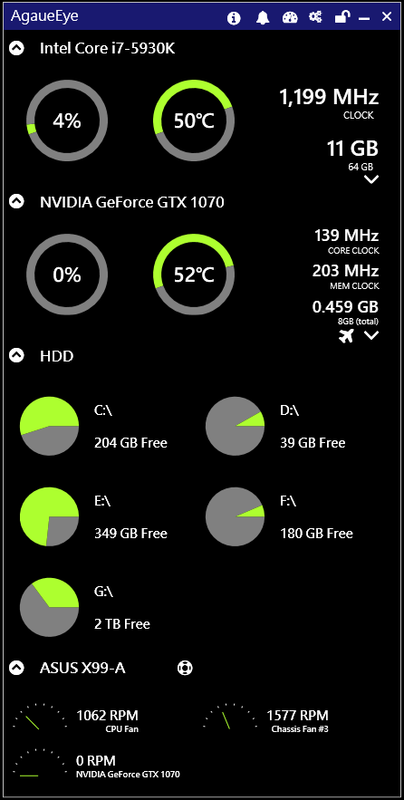 you can switch dashboard to small size. if mini dashboard still big for you, you can switch to Tiny Dashboard, right click dashboard to click Tiny Dashboard item. 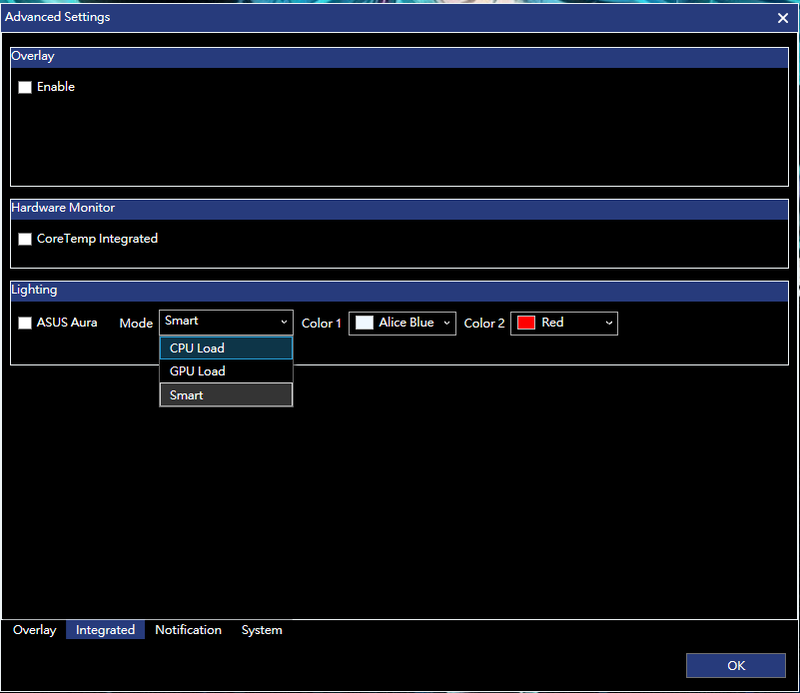 AgaueEye support localization, we build 2 langauge in first setup, English(default) and Traditional chinese, you can switch in Settings Window. 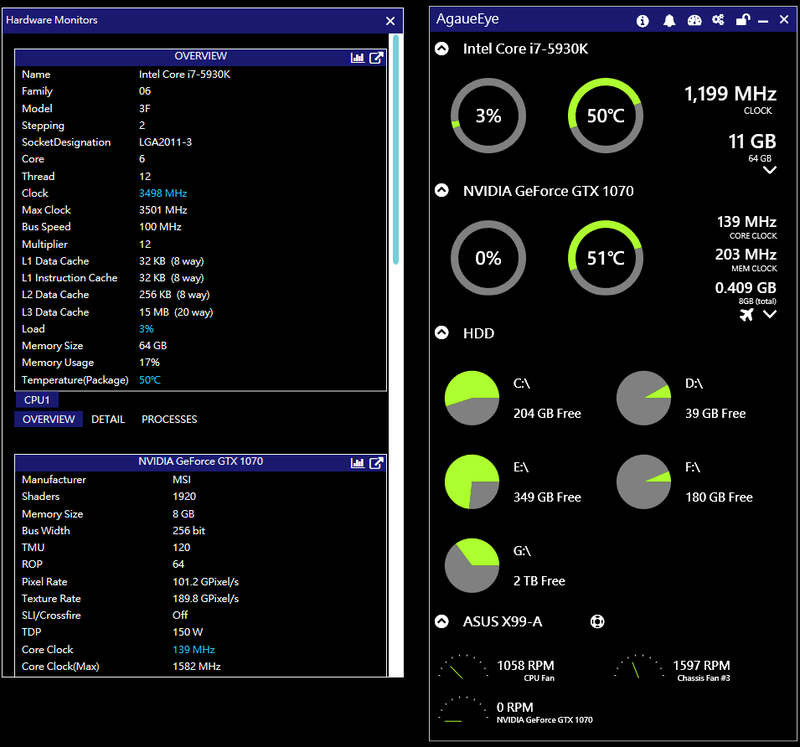 in here, you also can change Temperature display mode, Fahrenheit or Celsius. the languages file is simple xml(.xaml) in the AgaueEye\Languages folder, if you can help us translate more langauges, please send the .xaml file to agaueeye@xoptiray.com, we will review and add in next version, thanks. 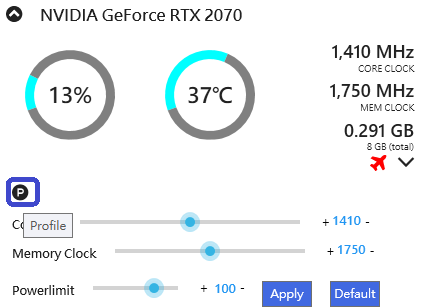 we support NVIDIA/AMD GPU overclocking, clicks of GPU section. 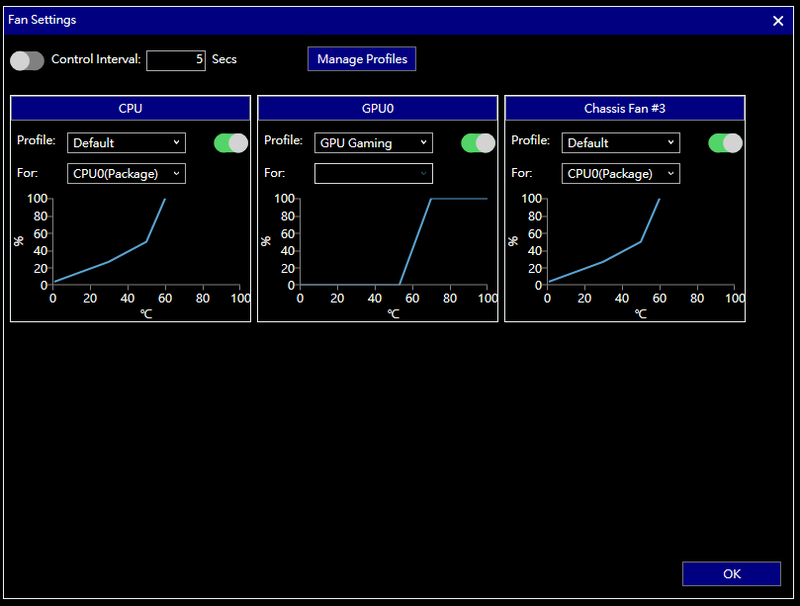 starting 0.67, we add the profile system for overclocking, now you can manage profiles via Advanced Settings section, in fresh system, here is simple a textbox for add profile. now you can adjust the clock of this profile. 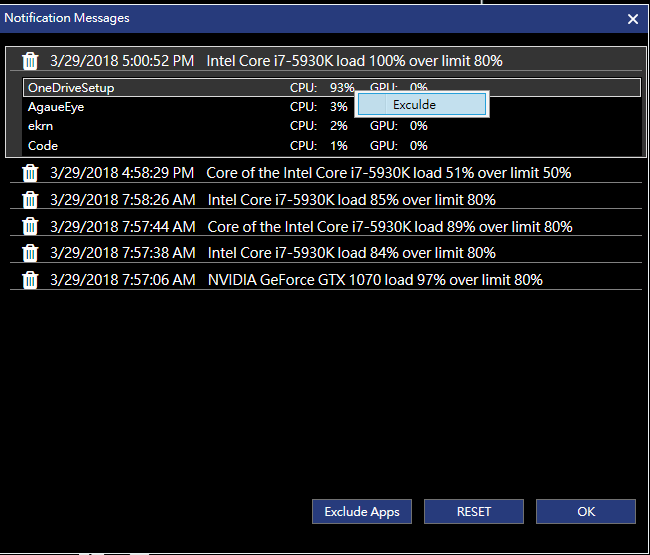 click apply button to save this profile when you done, the Enable On Game checkbox is mean the profile will auto apply when play any game, and restore to default clock when exit,a notification will show up when a profile is active in gaming. if you need adjust this Default Game profile, you can click to jump the profile. click can delete the profile. 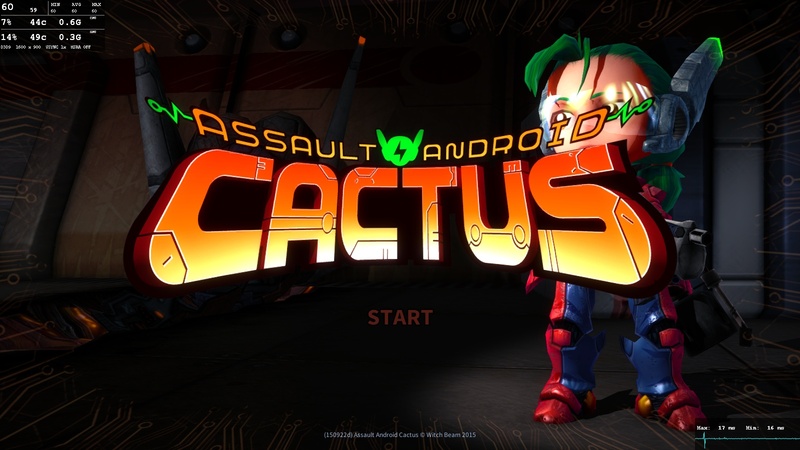 when you play game, the system also add a in-active profile for each game, you can adjust later then click apply button to active it, the profile will auto apply next time when you play same game. 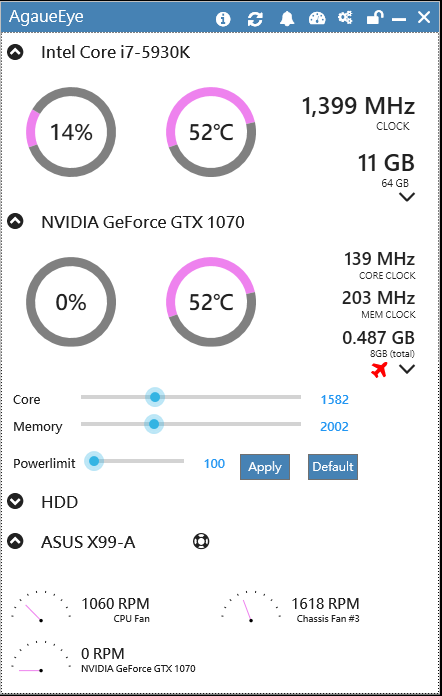 exclude special game profile, other profiles include Default Game profile can be apply quick in overclock section, just press . select a profile to apply. 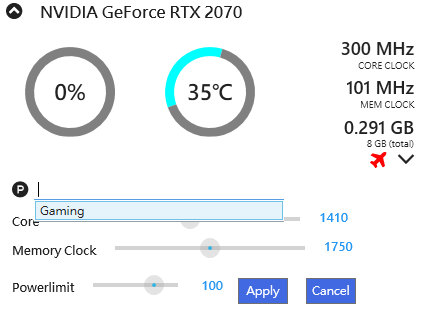 with Fans Control System, you can control CPU/GPU/Motherboard Fans, the system is base on profile and temperature, you can add profile with speed curve, and set it reactive to temperature, like you can use GPU Gaming profile and set it reactive to GPU temperature, just click of Motherboard section. 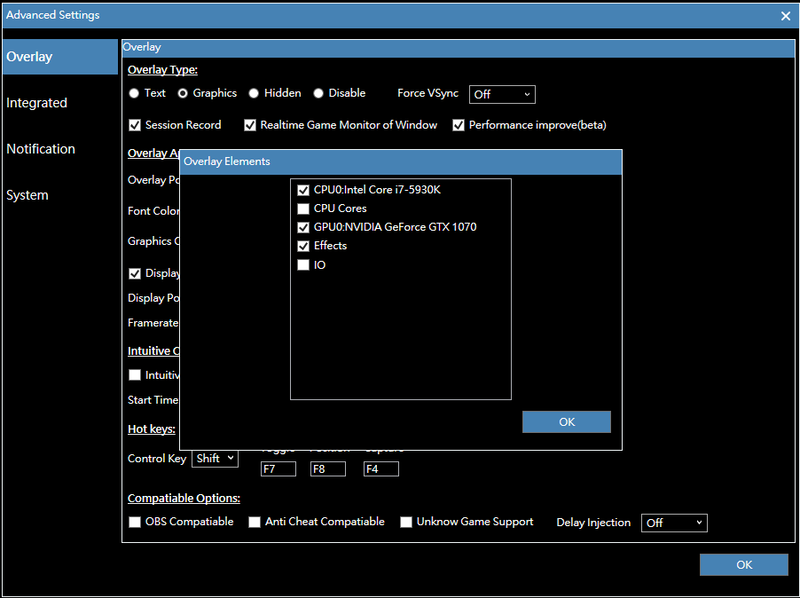 PS: the Fans Control System depend on motherboard/bios, for motherboard, there are limit PWM support, like only CPU/CHA-1 can be adjust, and some bios or motherboard do not allow turn some Fans(like CPU) complete off, for laptop and mobile GPU, usually not allow control too. 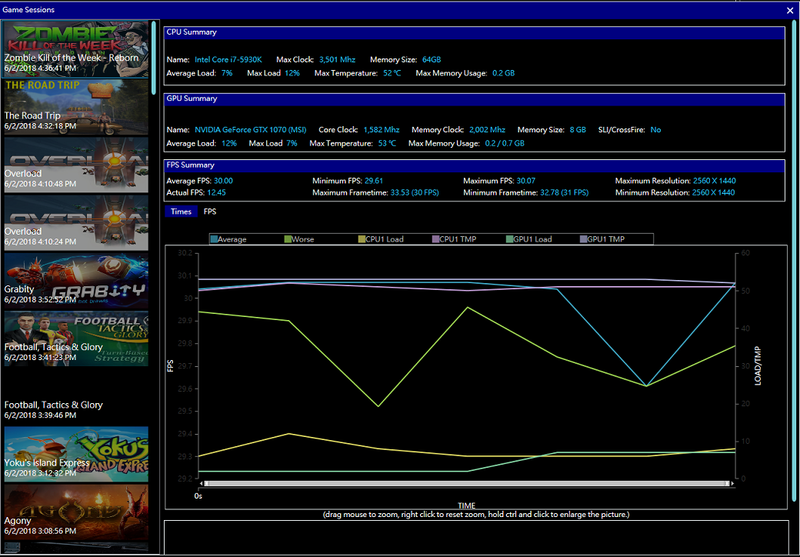 AgaueEye also record game state for analysis, to see the session report, just click of right top. 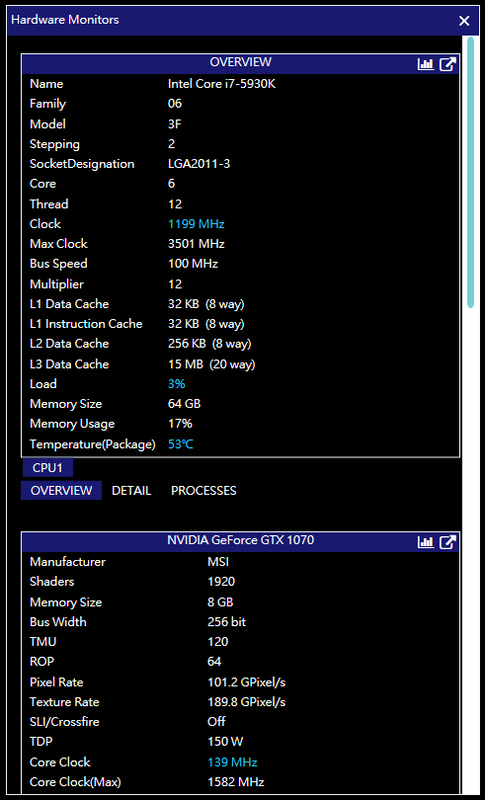 a timer series can help to figure out detail performance, but sometime it's too detail, we add 2 new reports in 0.37, the global FPS report provides a overview can quickly inspect the performance. 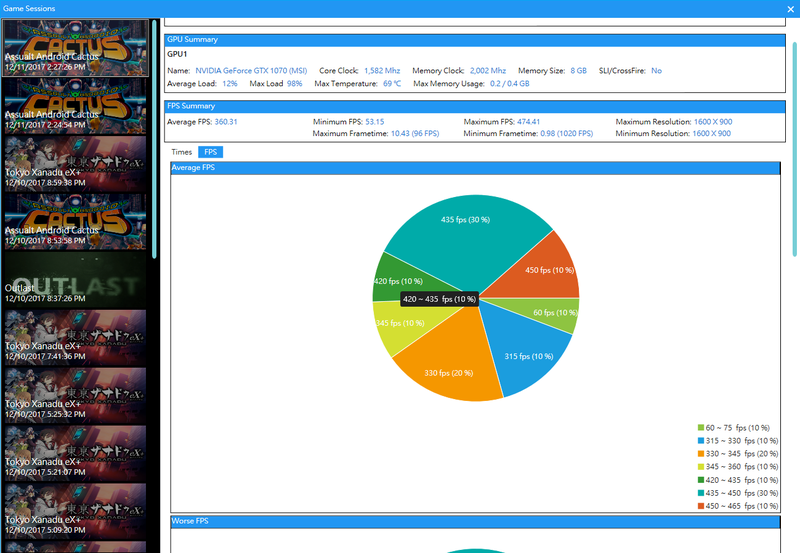 if you need more detail performance analysis report, the 1 frame report is answer, it show the 1 second report. 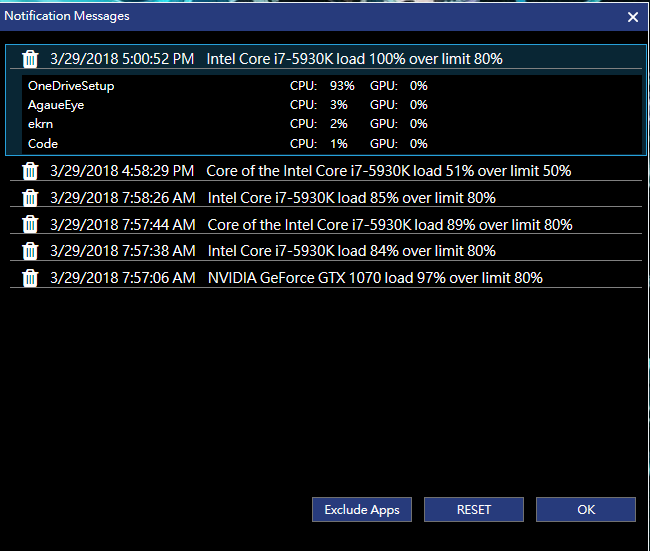 simple to say, it's automation game screen shot function, IC can capture game screen for you by automation, so you don't need do anything, just enable it, it will capture the game screen and combin into game state report, see below screenshot, i thinking you got it. How can i change Intuitive Capture Time? click settings icon of right top . 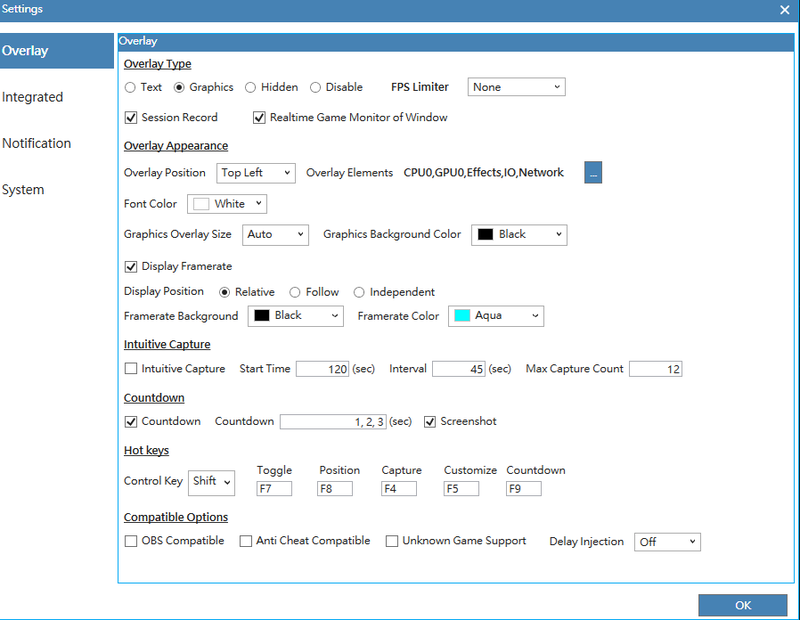 How about performance of Intuitive Capture? 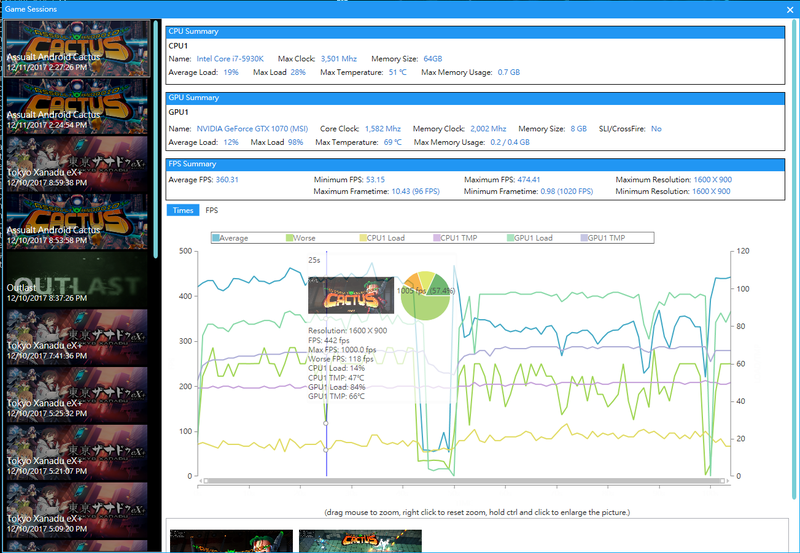 we can't tell you it no impact game performance, because any addition action can be impact game performance, all we can do is try to keep minimal. Countdown in overlay can show count-down clock in the overlay, when press Shift+F9(default), the count down clock will show-up. 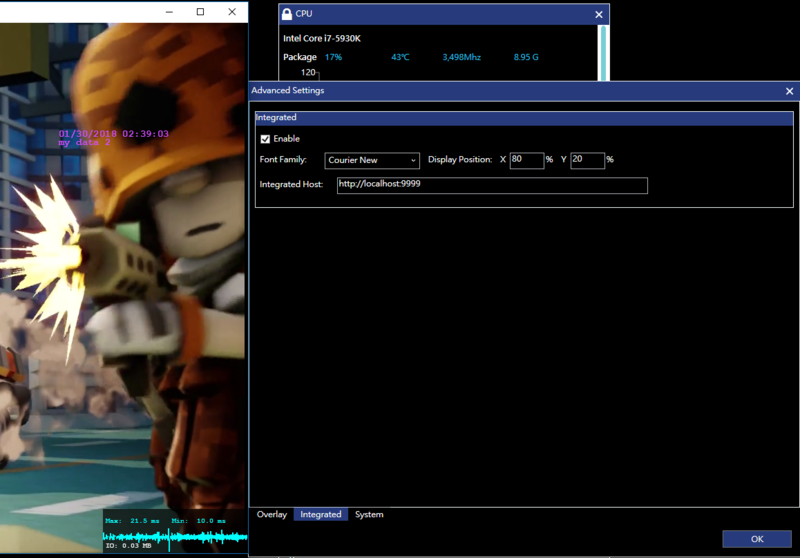 you can keep press Shift+F9 to increase times, the times can configure it in Setting window. we also support screenshot before/after countdown clock, when screenshot is enabled, we will take screenshot at countdown start and end. 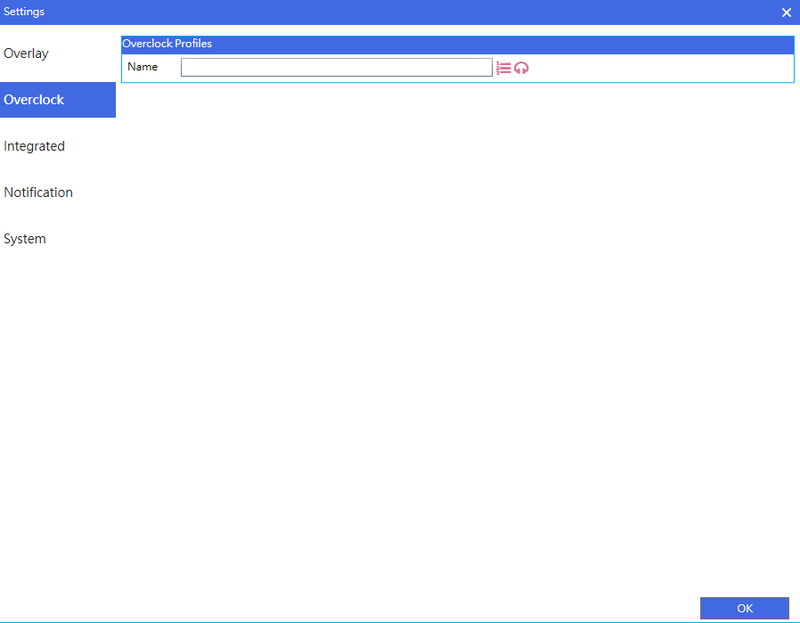 via customize function(Shift+F5 default), you can move the postiion with overlay part. Web Remoting System can allow you connect via iOS or Andriod, just remember to allow port in your firewall setting, if you are use Windows Firewall, click Enable Firewall button, we will try to setup for you. 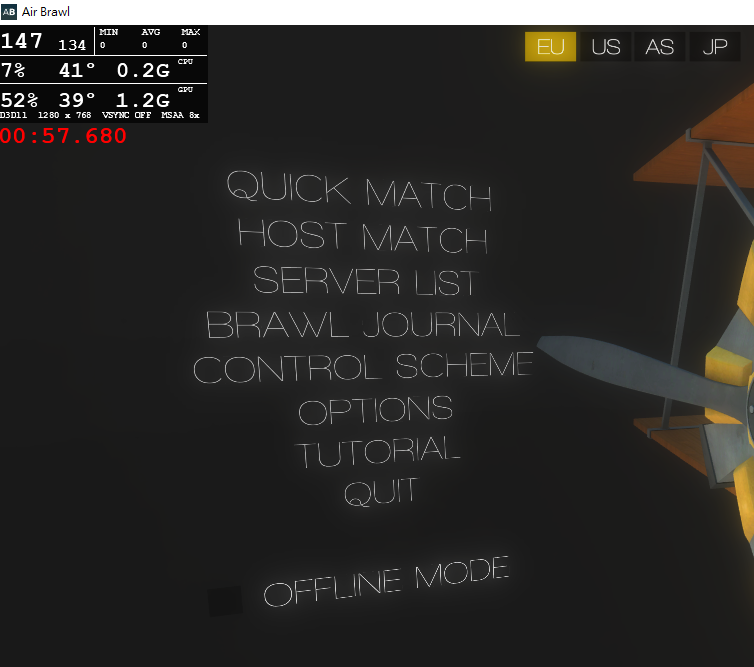 AgaueEye provides integrated mode, that's mean if you are developer, you can write few code to put your data into overlay, that will let your data showing in game, the steps is very simple, write a http server and put data out, AgaueEye will pull the data when need. you can Download the Host Code sample to see how it working. 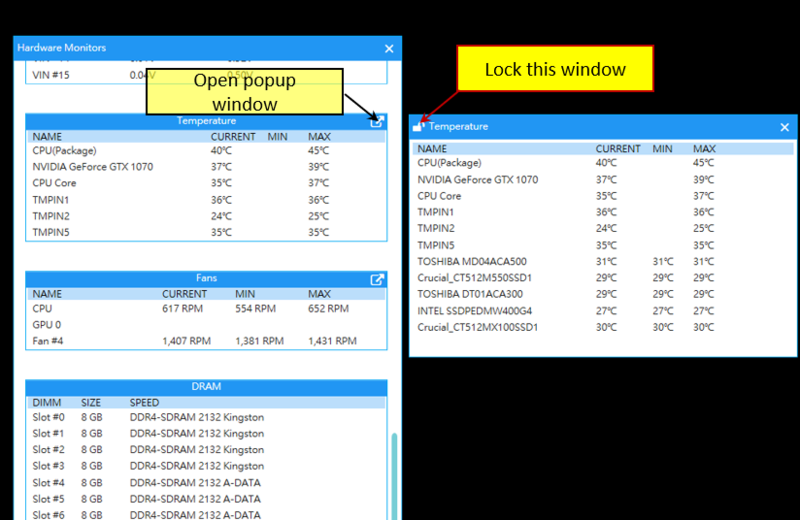 Notification System can alter you when condition is on, you can set the limit of CPU/GPU Load/Temperature, once the load or temperature reach the limit, AgaueEye will pop-up notification window to remind you. 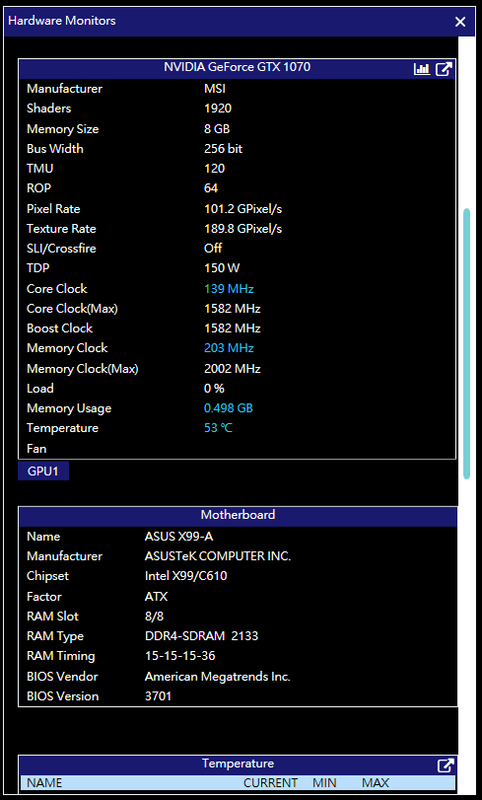 the settings is simple, but include some ideas, basically, the AgaueEye has be design as transparency tool, that's mean we try everything to avoid disturbing user if don't need, so notification has a Alter Period option, same notification only trigger once of the period, in default is 5 mins, it's mean if your CPU over 80%, it will notify, but next time notify will happen after 5 mins. click the notifiaction window or click bell icon from main window, you can see all notification messages. we also list top apps of each message to help you figure out the reason, if you need skip the notification for some app, just add it to exclude apps, next time will skip notifation if top app is in exclude app list. 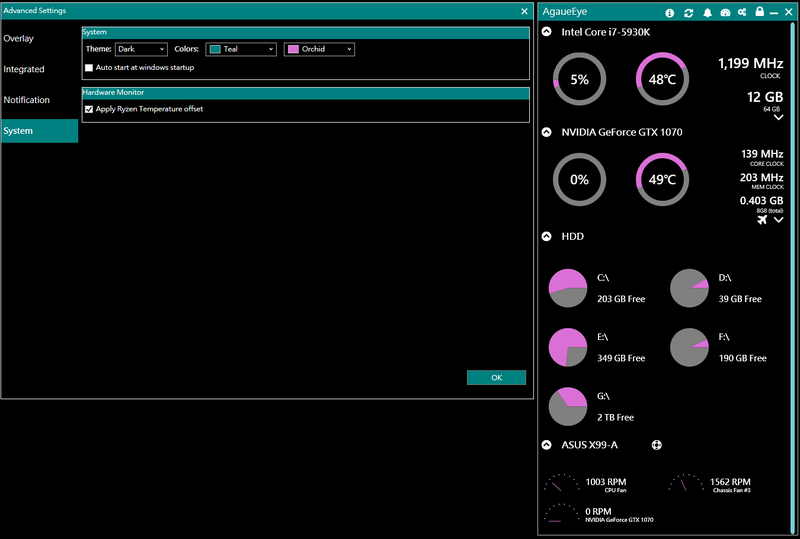 for now, we support 3 mode, CPU Load、GPU Load、and Smart, just choose 2 colors, AgaueEye will control the LED of motherboard, the Smart Mode will use CPU Load in normal, and Quality algorithm in gaming, we still plan to add more effects in future. 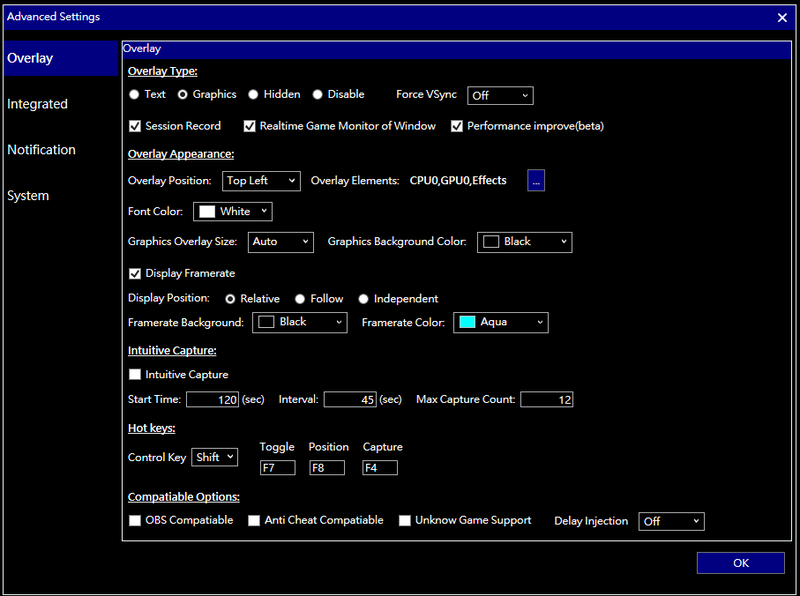 PS: because the SDK limit or something we don't know, you must install ASUS Aura software and change the lighting into fixed colors, then AgaueEye can control it.